*D’Angelo has been MIA for a minute now. Therefore, there’s some catching up to do. There’s a lot about the soul singer many folks don’t know. He gave a lecture at Brooklyn Museum hosted by Red Bull Academy and moderated by filmmaker and journalist Nelson George. 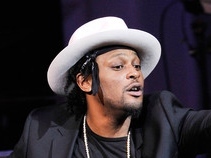 D’Angelo talked about his new sound and misinterpretation of his former sound. He’ll always love being a soul artist, but right now he’s exploring elsewhere. His new song, “Devil’s Pie,” might also be a misinterpretation. “The spirit of the vocals is more like a chain gang or a field of slaves picking whatever massa was telling us to pick in the hot sun,” he said. Discover more secrets about D’Angelo over at Essence.com.